There are few things we love more than avocados. We just can’t get over their creamy texture, and the fact that they’re considered a health food makes them all the more loveable. If you share our sentiments, then you will adore this avocado cilantro sauce recipe. This recipe is incredibly easy to whip up; all you need is a food processor and a handful of basic ingredients. To give this avocado cilantro sauce its creamy consistency, Greek yogurt gets blended with the avocado to create a rich, velvety sauce. The sauce is flavored with some garlic, lime juice, salt, and cilantro leaves, enhancing the sauce’s color and vibrancy. The garlic provides a little heat, while the lime juice adds some zesty flavor and keeps the avocado from browning. We like to think of this avocado cilantro sauce as our go-to dressing for almost every Mexican dish. 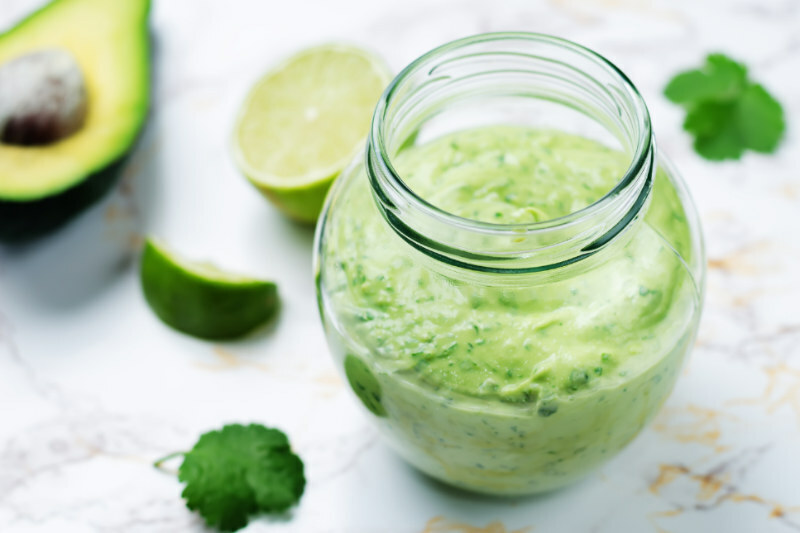 Whether it’s a green salad, tacos, shrimp, burrito, or enchiladas, the possibilities of using this avocado cilantro sauce are endless. This recipe comes together quickly and requires very little prep, which makes it simple to whip up any day of the week. That said, if you’d like to just make one batch ahead of time, you can easily do so. Just store the avocado cilantro sauce in an airtight container in the fridge. The sauce should last up to a week, but it’s best used between 3 and 4 days after making it. Add all of the ingredients to the bowl of a food processor. Blend until smooth. Taste test for salt and lime juice, add more if needed. If you would like to thin out the sauce a bit so it's not as thick and creamy, you can stream in a little more water, as needed. Store in an airtight container for up to 1 week.